According to data given by the related departments, Every year about 5 million people die and 100 million people injured in traffic accidents throughout the world, and the economic loss causes by traffic accidents every year takes up 1% to 2% of the total GDP. The traffic accidents have brought great influence to the perpetrators, victims and the society. However, how to reduce the happening rate of traffic accidents? In my opinion, the essential aspect to reduce the rate of traffic accidents is to improve the quality of traffic safety facilities like solar road markers. However, some traffic safety facility companies produce the products with poor quality and extremely low price, and put them into market, which threats the safety of people on the way. So something needs to be considered when purchasing the solar reflective road markers. 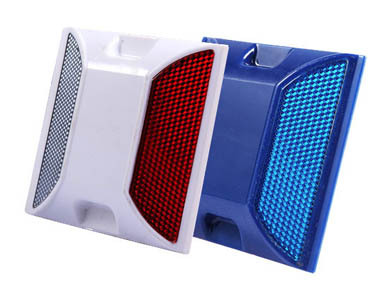 The solar reflective road markers are installed on the road surface, and it may be crashed by all kinds of vehicles, so the pressure resistance of the solar cat eye should be good. However, some of the road studs products by certain companies are hollow inside, which cannot resist heavy pressure, and they may break into pieces if crashed. For the solar road stud is installed outside, it may suffer from raining or other weather conditions. In order to make it can work as long as possible, the water-proof performance of the solar road stud should meet the standard. The quality of the solar reflective road marker has influence on the safety of drivers and pedestrians, so a company with professional research and development team and advanced technology should be chosen. NOKIN is a traffic facility manufacturer and supplier with rich experience and enthusiasm. 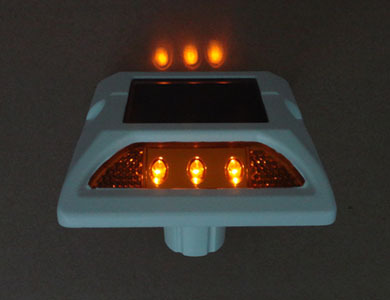 It can provide customized solar road stud in various colors and shapes. The team of NOKIN aims to bring the most advanced technology and high quality products to our clients. Adhering to the operation concept of “High Quality, Reasonable Price, Best Service, Right & Prompt Delivery”, NOKIN has concentrated in producing road stud, integrated solar street light and other solar road signs for 16 years. The factory of NOKIN locates in Shenzhen, and we promise to offer high-quality products with compatible price to all clients. We are looking forward to establish long term cooperation with you.